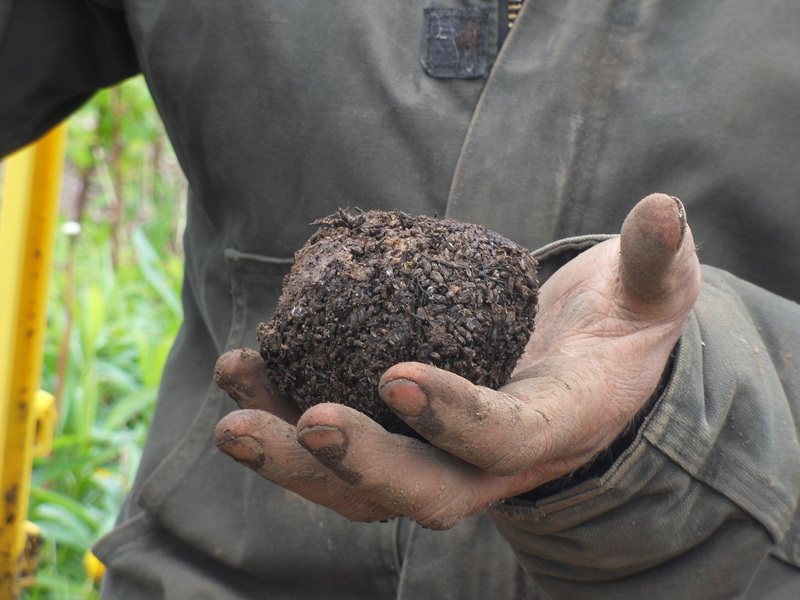 We’ve start to talk about the first biodynamic preparations last week. Now we’ll be following up with what is called the compost preparations. The next 6 preparations are called compost preparations because they are used in the compost pile. They are used as a set to treat a 10 tons compost pile. They are medicinal herbs: yarrow, chamomille, stinging nettle, oak bark, dandelion and valeriane. They guide the compost pile to breakdown in a certain way. When we apply them to the land, it heals the land and gives it directions. It is the yarrow preparation. Yarrow is a plant that is good to have on the hedge of your fields. It’s like friends, said Johan, it is not what they do, it is what they are, which is important. It permits the plants to attract trace elements in extremely dilute quantities for their best nutritious. You use one teaspoon for 10 tons of compost, inside a small compost paddy which you insert to the compost pile half way with a stick . When we use the compost preparations it is like alchemy, it turns for exemple potassium into nitrogen or whatever is needed for growing. Yarrow is a plant used for liver and kindneys. Flowers are picked in June- July when they are tender flowers, then dried and hanged up the whole summer in a stag bladder. The male deer is a very alert animal in always extreme communication with its environment. It is the chamomille preparation. 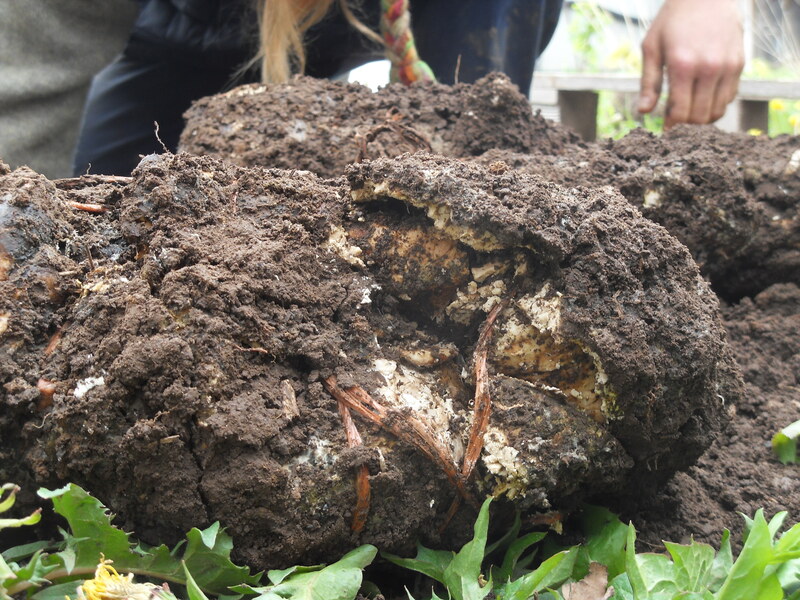 It stabilizes the nitrogen (N) within the compost and increases soil life so as to stimulate plant growth. Chamomille is a calming herb which helps digestion. That’s why we will stuff it in an animal part related with digestion. It will be the small intestine of a cow. We pick the small flowers, and make them dry before stuffing them up like sausages. During the burying process over the winter, the intestine is decomposing, and only the flowers remain. 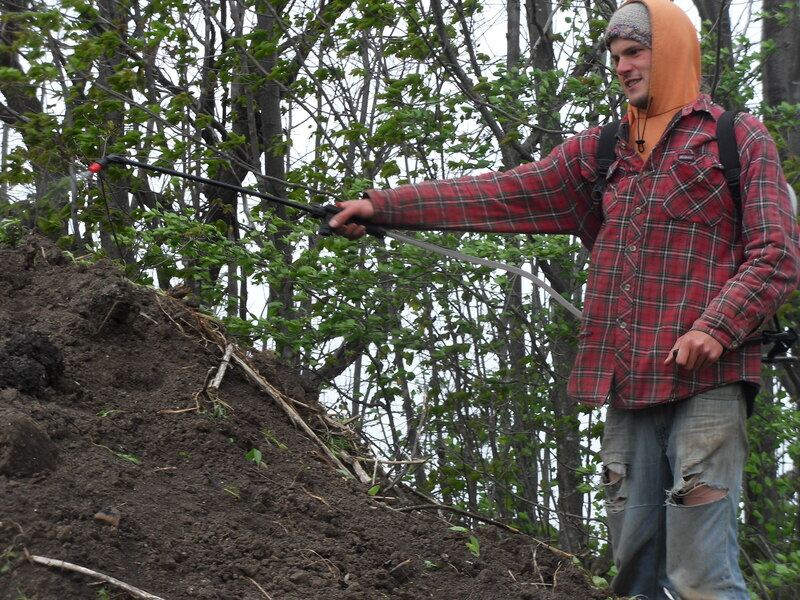 We use only one tea spoon for a 10 tons compost pile. It is the stinging nettle preparation. 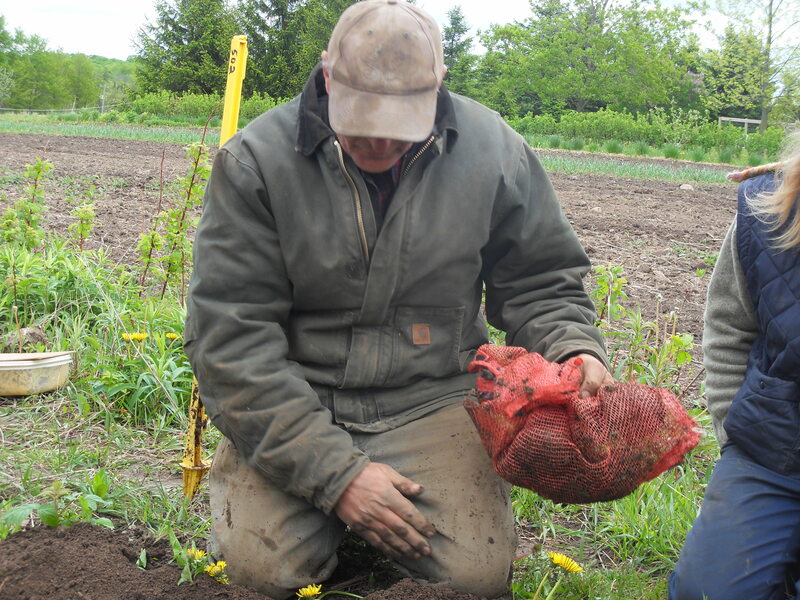 It works on the nitrogen content of the compost. It stimulates soil health, providing plants with the individual nutrition components needed. We will just talk about it with Johan today. The stinging nettle is almost like an animal as when you touch it, it stings you. When it starts flowering, you cut it without the root, dry it and bury it for a whole year. Then you break it off before using it into your compost. 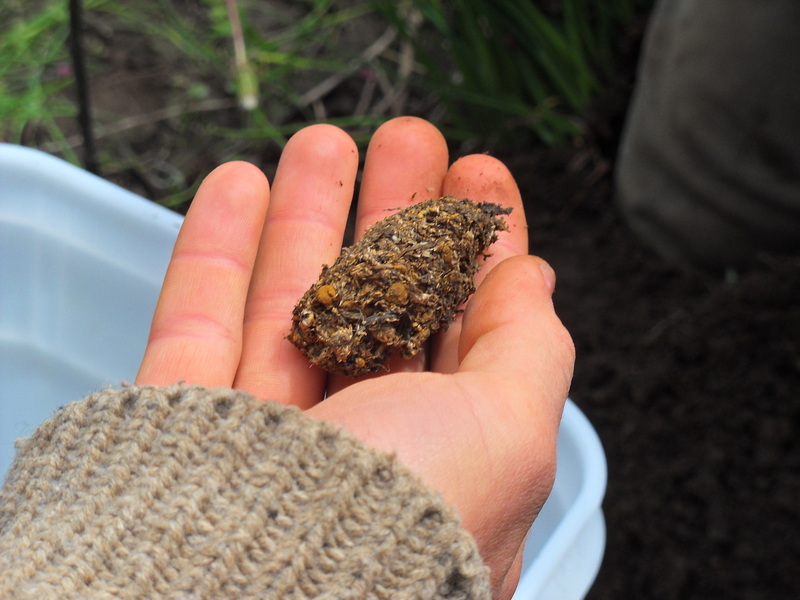 We use a tea spoon for treating 10 tons of compost. It is the oak bark preparation. The oak bark is made of 75% calcium, that’s why we should use an animal part related also with calcium. 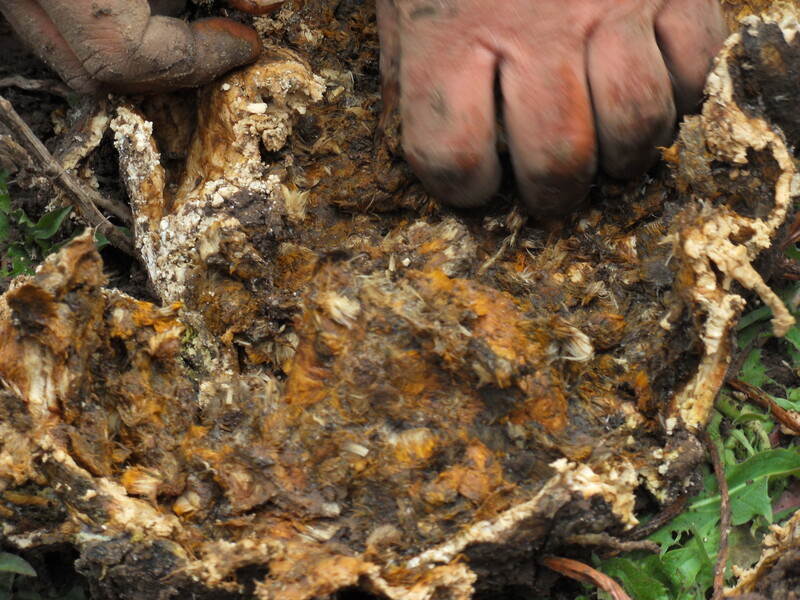 We take shavings from an oak bark, and put it together in a container made of calcium. 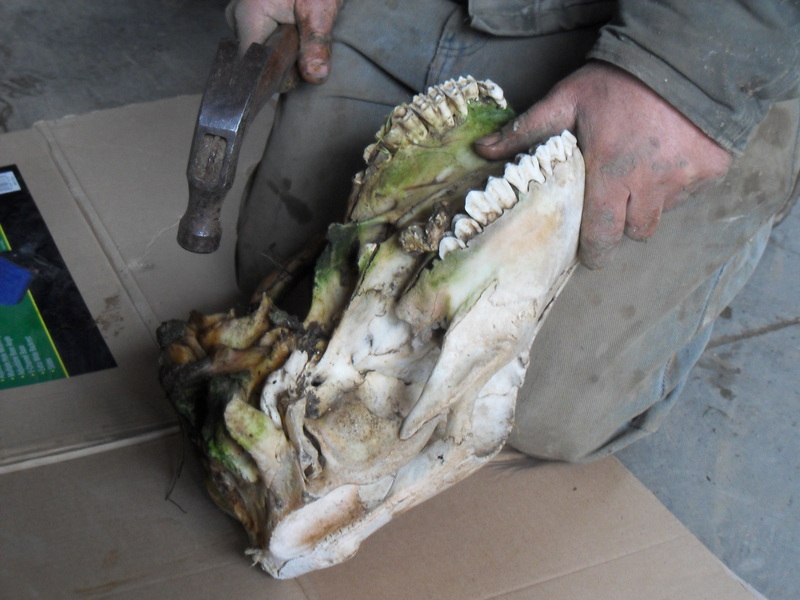 In this preparation we use a cow skull (we could use also a pig skull). The oak bark has the property of strenghtening blood vessels. It is stuffed in the cavity of the skull where the brain is. 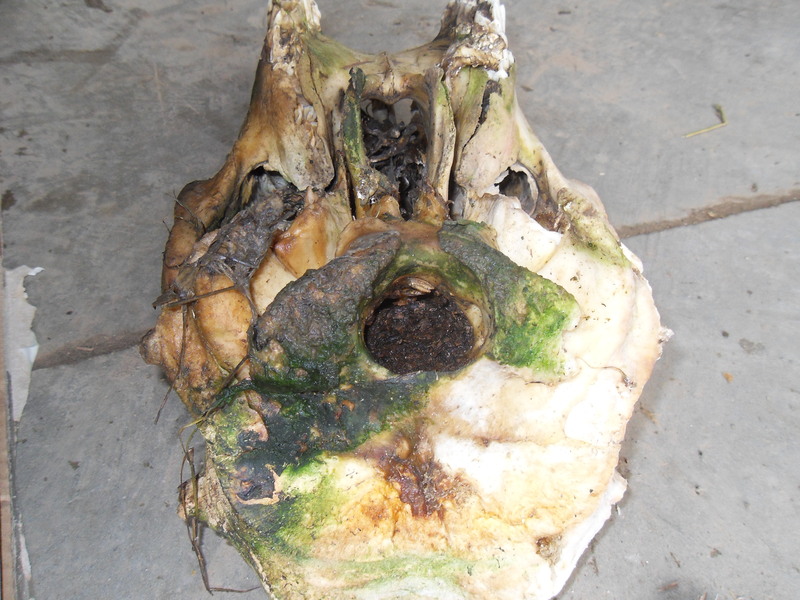 We can use only the skull once as we have to break it to remove the oak bark after the winter. It is buried in a damp place. This preparation provides healing forces (or qualities to combat harmful diseases). 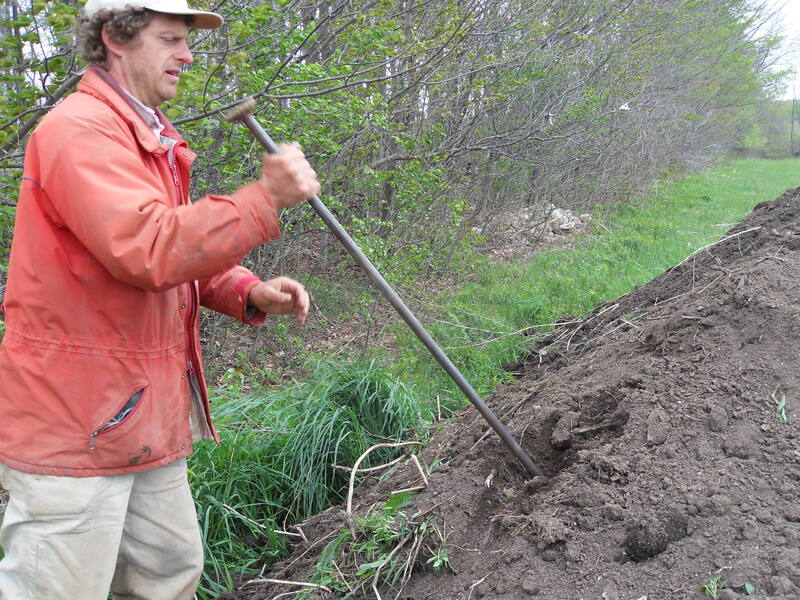 Here again it is a tea spoon for 10 tons of compost. This is the dandelion preparation. Steiner used to call the dandilion plant « the messenger from heaven ». 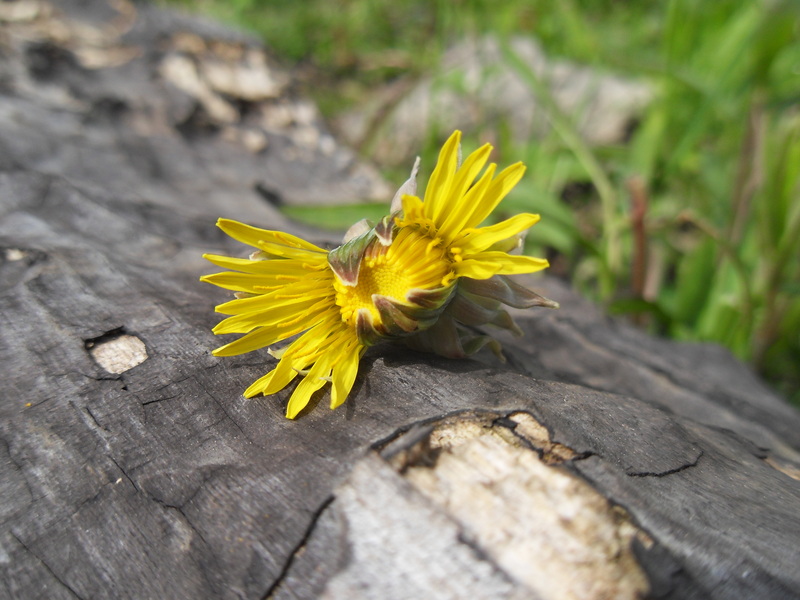 We pick the dandelion flower when the middle is tight. This preparation works on the silica of the plant. It stimulates the relation between silica and potassium so that silica can attract cosmic forces to the soil. It sensitises the plant from its surrounding. It is put in the mesentery of a cow, the mesentery being a membrane underneath the skin which holds the intestine in. It is buried all over the winter. We are still using one tea spoon for 10 tons of compost. It is also called the valerian preparation. Joahn grounds up fresh valerian flowers, strain them out in a cheese clothe to get the juice out and make it fermented a bit. He then adds few drops in a gallon of water, and stir it for 20 min. Then, the preparation is sprayed over the compost pile. 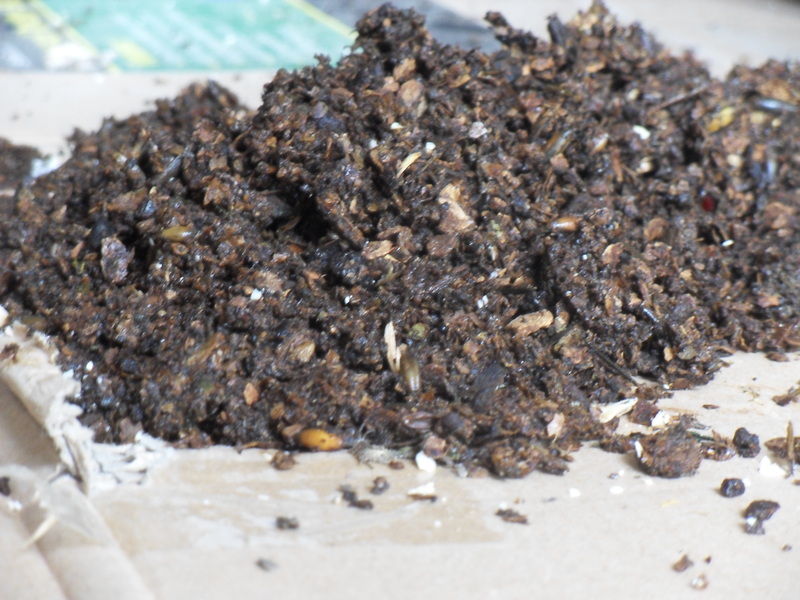 It stimulates the compost so that phosphorous components will be properly used by the soil.